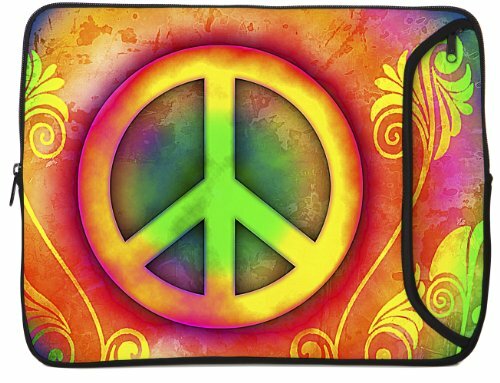 Designer Sleeves Peace iPad Case and Other Tablets (10DS-PEAC) by Designer Sleeves at SCRHI. SKU: ads10dspeacb. MPN: 10DS-PEAC. Hurry! Limited time offer. Offer valid only while supplies last. The Peace Sleeve protects your ipad or tablet in style. The neoprene case cushions your device for maximum moisture, shock and scratch protection. The Peace Sleeve protects your ipad or tablet in style. The neoprene case cushions your device for maximum moisture, shock and scratch protection. The external zippered pocket allows you to securely carry items (power cord, etc.) without scratching your ipad, Galaxy or other tablet. The full color graphics, applied with our SublipreneTM process, will never crack, peel off or fade. If you have any questions about this product by Designer Sleeves, contact us by completing and submitting the form below. If you are looking for a specif part number, please include it with your message.